Someone explain to me how Marcel Vigneron was, until recently, only the sous chef at The Bazaar? And while they’re at it, explain to me how Ilan beat him in Season 2 of Top Chef to win the title? I’ve eaten at The Gorbals and there really is no comparison. It’d be like Hosea Rosenberg beating Michael Voltaggio. Okay, I exaggerate. But only just. Speaking of Michael Voltaggio, I was at his Hatchi tasting in July and wondered how Marcel’s meal would measure up. After all, Marcel was Michael’s sous chef at The Bazaar until earlier this year. Last night, Marcel more than held his own. His Hatchi tasting was close to flawless. Imaginative, exceptionally well executed, complex and, ultimately, totally satisfying. As good as, if not better than, meals I’ve had from more celebrated chefs in recent times. Someone give this man his own restaurant. Or perhaps they already have. 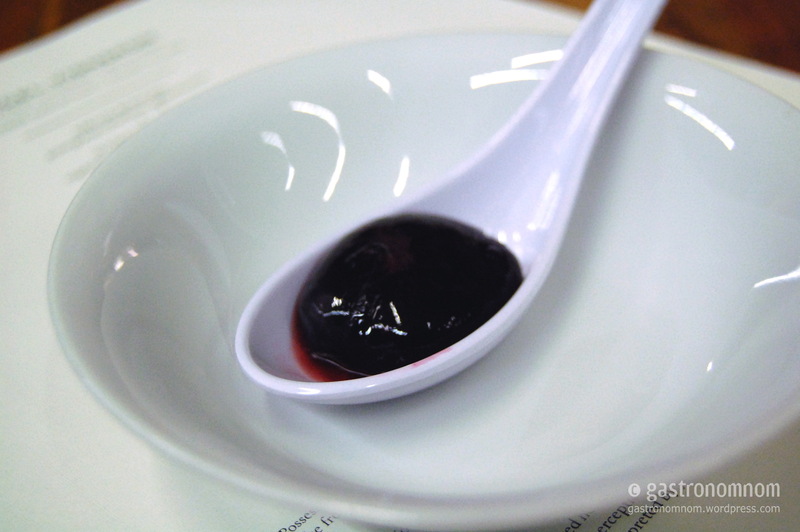 Marcel opened his eight course tasting menu with an amuse bouche of a pomegranate blueberry spherification. 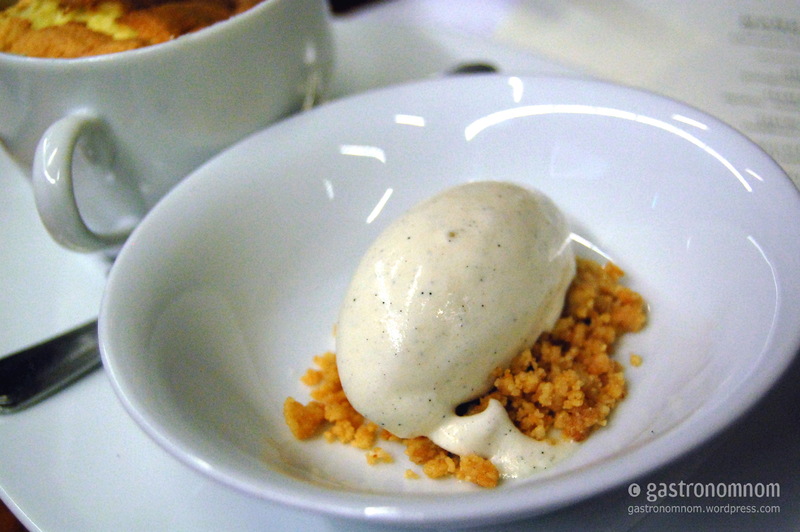 Perhaps the most iconic representation of molecular gastronomy, it was a perfect introduction to those unfamiliar with Marcel’s style. A shimmering and mysterious dark blood red sphere served on a Chinese soup spoon. Take it whole into your mouth and pop the sodium alginate polymer skin. Inside, pomegranate juice and a whole blueberry. Perhaps a little vodka and it would have been perfect. Luckily for me, my Negroni cocktail arrived just in time. 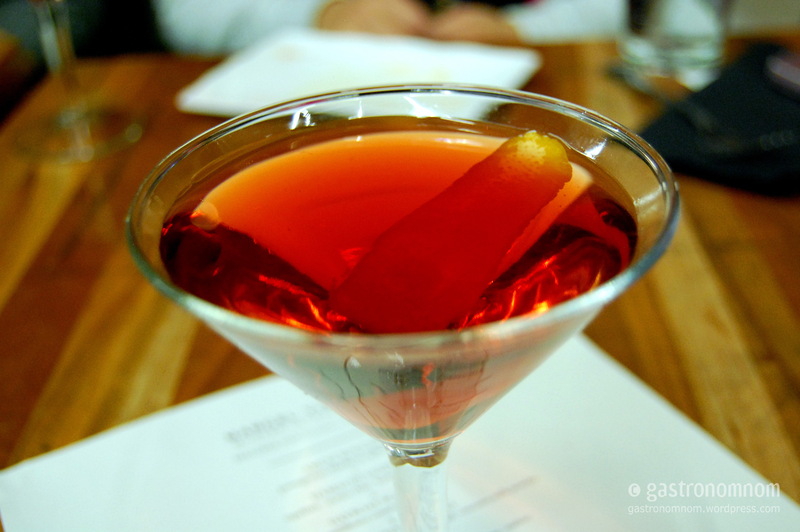 Gin, Campari and Antica Formula vermouth, garnished with orange rind. Displaying the bitter herbaceous quality of Campari, this cocktail was very well mixed by Devon Espinosa, mixologist at The Tasting Kitchen in Venice and cocktail alchemist for the night. I also got a lesson in and taste of his Coca Cola spherifications for his Coke in Manhattan cocktail. I imagine this is how they’ll drink Coke in space. The first course arrived. 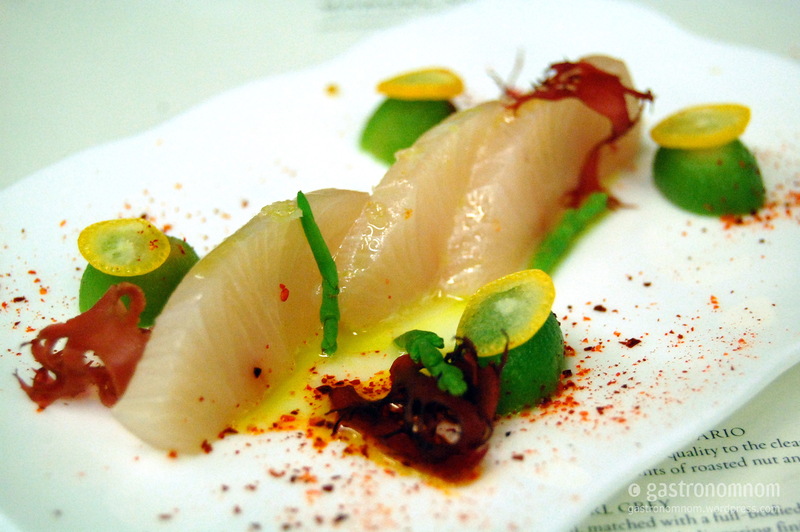 Hamachi sashimi with espelette, momo chan, kumquat and iceplant. The hamachi was clean and fresh, dressed simply with some sea salt, espelette (those red chili flakes) and, I think, yuzu. The momo chan (the green Japanese baby peaches) added a sweet touch and sat under slices of kumquat, which lent that slight bitterness of citrus rind. The dish was then garnished with iceplant and red seaweed. Next up was the dayboat scallop with cauliflower couscous and seaweed. I loved this dish. The scallop tasted as good as it looks, with just a bit of crunch of sea salt. The pickled seaweed added a nice dimension, the cauliflower cous cous added texture and the purple, pink and yellow dots of cauliflower puree around the plate added pure whimsy. 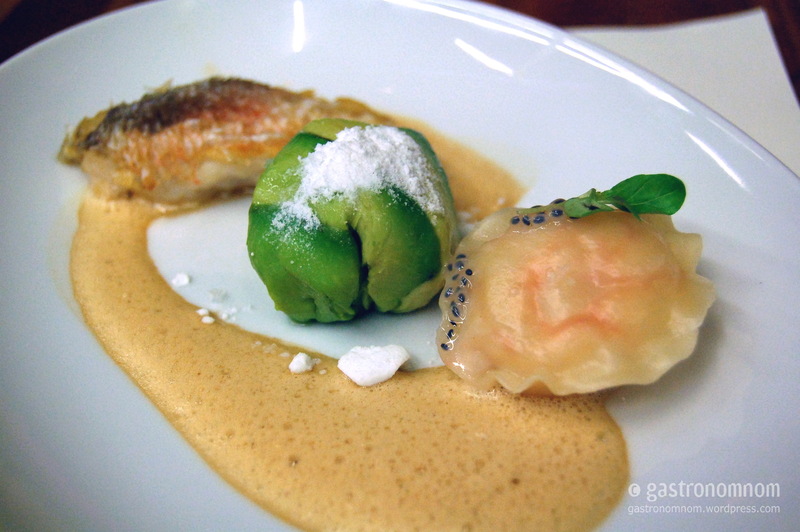 Third course was a langoustine ravioli with thom khai foam, avocado wrapped mango, petite basil and coconut milk powder. Another great dish. Our plates also came with an additional piece of crispy fried fish, which I noticed wasn’t included in some diners’ plates, making this almost two dishes in one. The fish was fried crispy with skin on. It was linked across the plate by a delicious thom khai foam to the langoustine ravioli, which was garnished with the petite basil and basil seeds. The langoustine ravioli itself was firm with a generous serving of langoustine on the inside, reminding me more of a Chinese dim sum gow gee than a traditional ravioli. Between the fish and the ravioli was the avocado wrapped mango. Sweet dices of mango wrapped in slices of avocado, this was a great counterpoint to the strong Thai flavor of the thom khai foam. Sweet, refreshing, simple. It was sprinkled with coconut milk powder, which tasted, unsurprisingly, of coconut milk. Combining the fish with the foam, the ravioli with the foam, the ravioli with the mango, and the fish with the mango all brought new dimensions to this dish. Truly a tour through South East Asia on a plate. 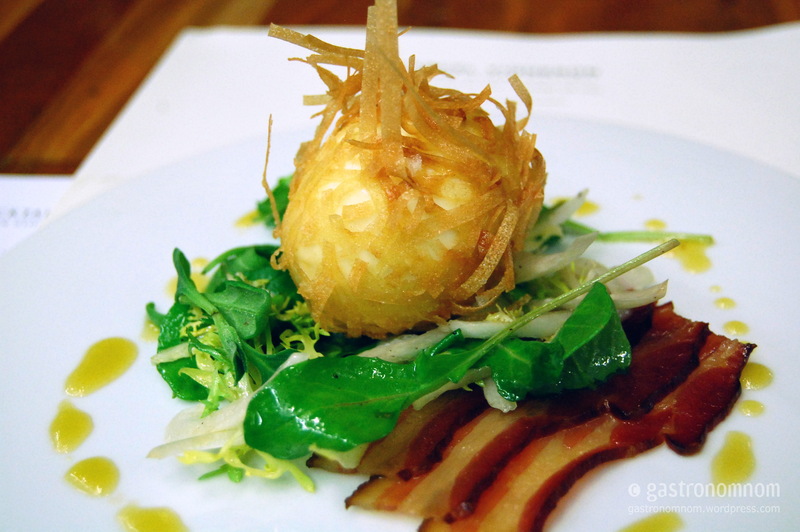 Leaving Asia, the fourth course was a Lyonnaise salad of frisee, “nesting” egg, bacon, sherry vinaigrette and endive. The egg, “nested” in crispy wonton strips, was a playful rendition of this classic. The bacon was good, as was the endive and frisee and vinaigrette but after the taste sensations of the previous three courses, this one seemed a bit safe. Safe but still beautifully executed and plated. 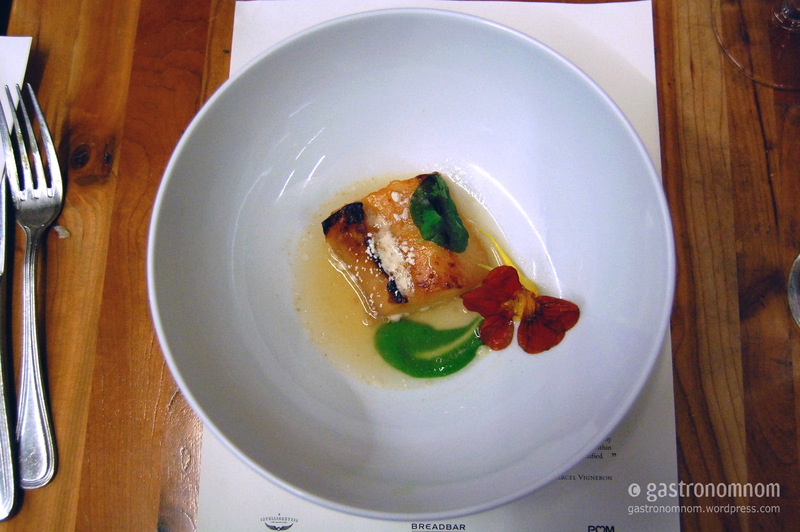 Next was the miso honey black cod with nasturtium textures and sesame oil powder. A broth was then poured into the bowl tableside. The honey in the miso glaze lent a sweetness to the fish. A sweetness that may have been overpowering in a larger serving but, for this small serve, was perfect. The sesame oil powder, made with the addition of tapioca maltodextrin, dissolved in the broth adding a nice slick of oil to it. The nasturtium was presented three ways: a flower, a leaf and a peppery puree. 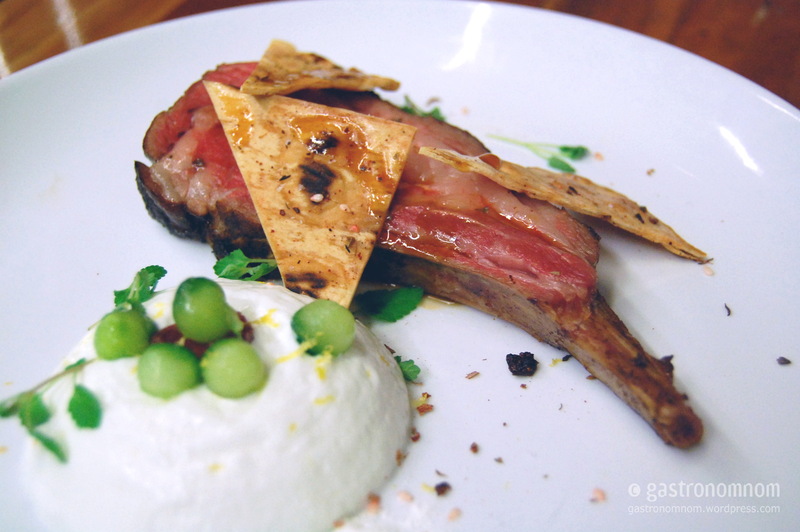 Course five was a vadouvan lamb with flavors of tzatziki, lavosh, pickled onion and sumac. The lamb, looking rare and fatty, was beautifully cooked, the vadouvan crust adding an earthiness and spice. I must admit, there was too much fat for me and I did end up trimming much of it, but the lamb was delicious. The tzatziki, cucumber balls, pickled onion and toasted lavosh were all welcome accompaniments but the lamb was definitely the star. The final savory course was the grass fed “corned beef” – a sous vide short rib, textures of corn, Saul’s pastrami and black trumpets. 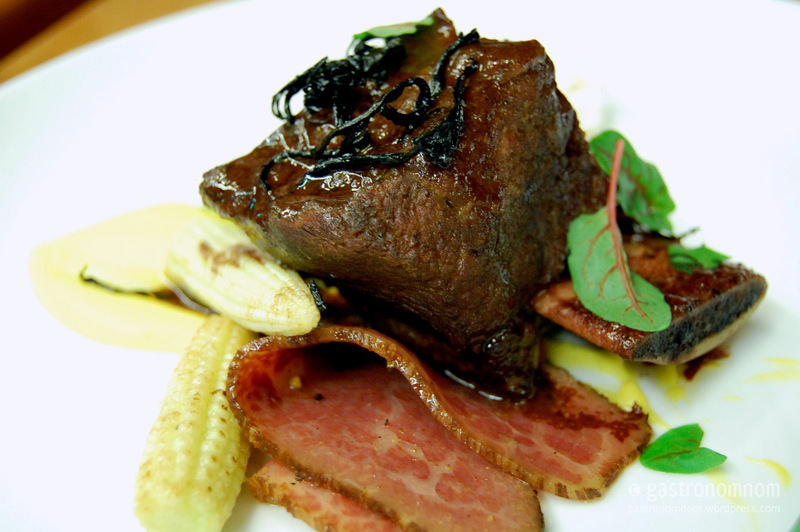 The sous vide short rib was thick cut and tender, sauced with a black trumpet mushroom sauce. Corn was prepared in three textures: baby corn, a corn puree and popcorn. I loved the corn puree on this dish. Some of my fellow diners felt it was too sweet but I loved the sweetness it imparted to the short rib when eaten together. The pastrami, named after Saul Cooperstein at SBE, and interestingly also served by Michael Voltaggio in his Hatchi menu with a short rib, was loved by some of my companions but I felt it was extraneous. The dish, for me, was really the combination of the short rib and the corn puree. 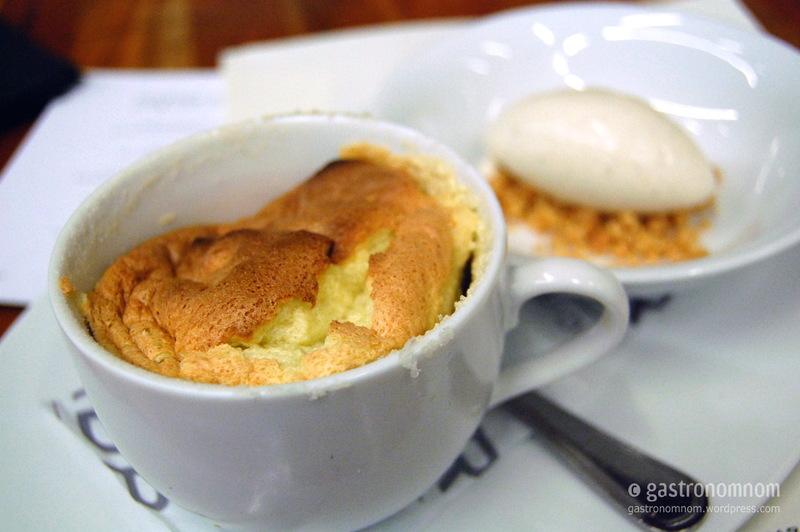 Dessert was a green chartreuse souffle with a vanilla bean ice cream. Just prior to this point, I did step away to chat to some friends and returned to a deflated souffle, so the photo doesn’t represent the souffle when served. I did see it come out to other tables and it stood high and proud. It was, however, moist and fluffy with a nice baked crust. As you reached the bottom of the cup, the alcoholic taste of the green chartreuse became increasingly pronounced until the last couple of bites seemed soaked in it. 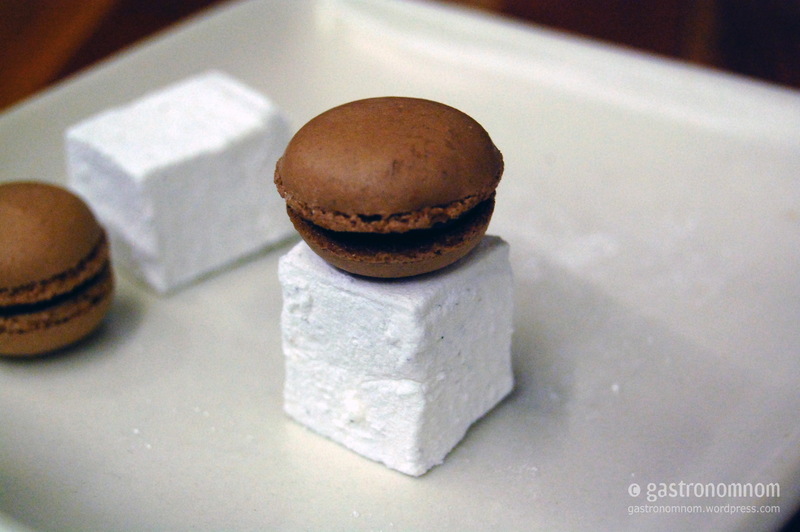 Dessert was followed by little macarons and cubed marshmallows. In the vein of Marcel’s beautiful and sometimes whimsical plating that evening, I decided to stack these into a small tower. Because I’m old enough to play with my food. Lastly, we were brought the famed Dragon’s Breath, now only served at The Bazaar’s private dining room, Saam. 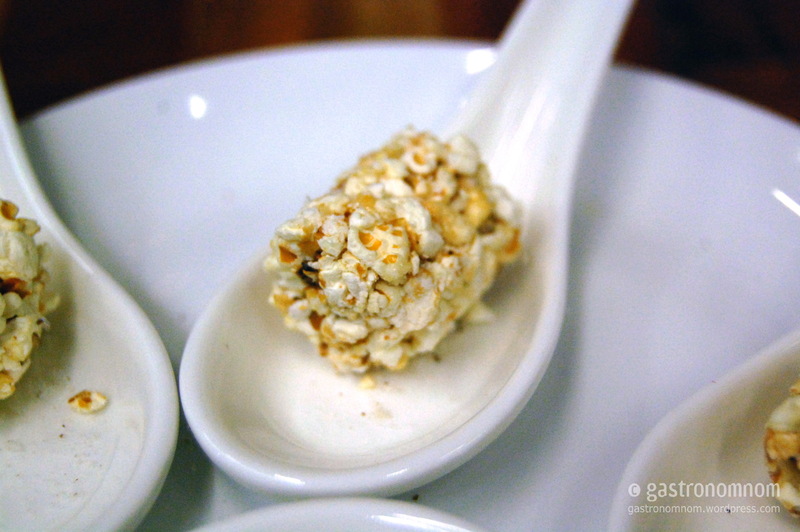 Small rolls of popcorn dipped in liquid nitrogen. Pop them into your mouth and the warmth causes you to breathe smoke, hence the name. Unfortunately these were not prepared tableside so by the time we ate them, there was no more smoke. But they did bring another serving and instructed us to eat them immediately. We got the requisite smoke, although it was more a wisp than a cloud, but nevertheless still fun and interactive. That rounded out one of my most memorable meals of the year. Imaginative, playful, beautifully executed and plated, and a gastronomical tour through Asia, Europe, the Middle East and the future of food. Marcel left The Bazaar just weeks before his Hatchi tasting. I’m looking forward to seeing where he resurfaces. And I’ll be there with reservations. ← Simon LA. The Bryan Adams of chefs. Mouth watering in memory from your lovely pictures! The scallop, the lamb and langostine ravioli were favorites! GORGEOUS! Emailing to Marcel now!! Fabulous meal with a fabulous retelling! Thank you! Great stuff! Marcel is so talented! I missed this. Why did he leave? I’m not sure. I heard this at Hatchi from other bloggers but no news on why or where he may reappear. I’m hoping he’s moving onto his own gig. Maybe someone else has news? I’m missing that scallop today. Mmmm. Actually, some of these photos didn’t need much Photoshopping at all. The light was pretty good and even. Just needed some white balancing and some brightening. Momo chan is Japanese baby peaches. Like the ones in the Japanese baby peaches dish with persimmon, yogurt and olive oil at The Bazaar. Now I am REALLY sorry I missed this event. Damn the winter cold season to Hades and back again. Cannot wait to see where Marcel lands. When he does, let’s set a date! Ok, granted the meal was good. However, I wouldn’t go as far to say that it was “almost flawless.” Some dishes had great flavors and others were lacking. The souffle I had was not prepared correctly. The macarons were a complete disaster and tasted more like a dry cookie than anything else. Plus, the guy proved to be a complete douche by ignoring most of his customers and only catering to the “in” crowd. A simple thank you to the crowd would have been nice. I had several friends sitting at other tables and, yes, some mentioned that their dishes didn’t come out as well, or slowly, or had substituted ingredients. For instance, I don’t think most tables got the crispy fried fish with their langostine ravioli, some tables had a breaded egg rather than the “nested” one, the hamachi ran out, some didn’t like the firmness of their ravioli, etc. But everyone at our table was universally impressed by our meal. Perhaps those are the vagaries of a one-off dinner like Hatchi. Every night is opening night. Marcel, be a little more creative and stop copying Joel Robuchon’s dishes. With those dishes, he does not deserve her own restaurant. Who r u Alice ?? You are really informed !! 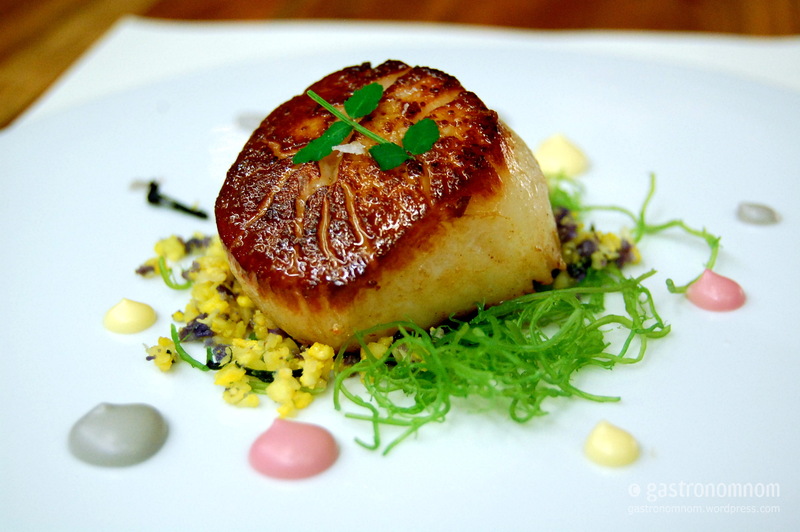 I worked at Robuchon and all those dishes look really familiar to me …. 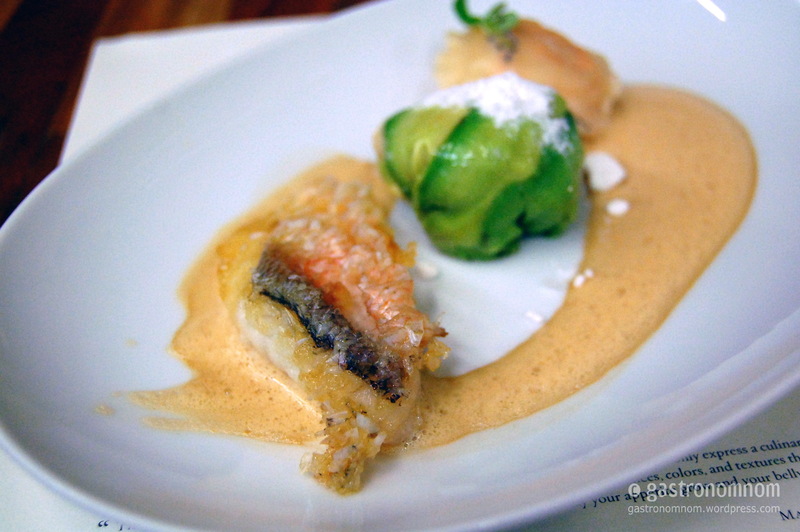 cauliflower couscous, langoustine ravioli, egg nested, soufle chartreuse …. WTF !!!! Be more more creative Marcel !!! I looooove Marcel and have a secret crush on him, and yes, I like Michael V, too. Hehe, they are so talented. Is he still at Breadbar, I so wanted to eat there. No, it was a one-off tasting event. But hopefully he’ll resurface somewhere else soon. marcel has been an food artist since i can remember. nice to see him where he is today. Looks like an amazing meal. I love your pictures.